which features 5 more special places, compiled by the Mission Blue Foundation, which Dr. Sylvia Earle is targeting for protection as part of her 2009 TED wish. The Hope Spots tour begins in the Gulf of Mexico deep reefs and the Flower Garden Banks. From there, you’ll find a grinning lemon shark in the Bahamas. Next, a video from National Geographic narrated by Dr. Earle, introducing the Patagonian Shelf hope spot. As you venture to the Coral Sea hope spot, you’ll meet a brightly colored, and in this case very talkative, fish known as a wrasse. The tour concludes in the Micronesian islands with a photo of explorers Don Walsh and Jacques Piccard in the Trieste bathyscaphe above the Marianas Trench, the deepest place on earth. This year is the 50th anniversary of Captain Walsh’s plunge in the Trieste down nearly seven miles to the ocean's deepest point. For that remarkable achievement, he received National Geographic Society's Hubbard Medal, the society’s highest honor, as well as U.S. Department of the Navy's Distinguished Public Service Award. Both were presented in ceremonies last week in Washington, DC. No one has ventured to "Challenger Deep" since. 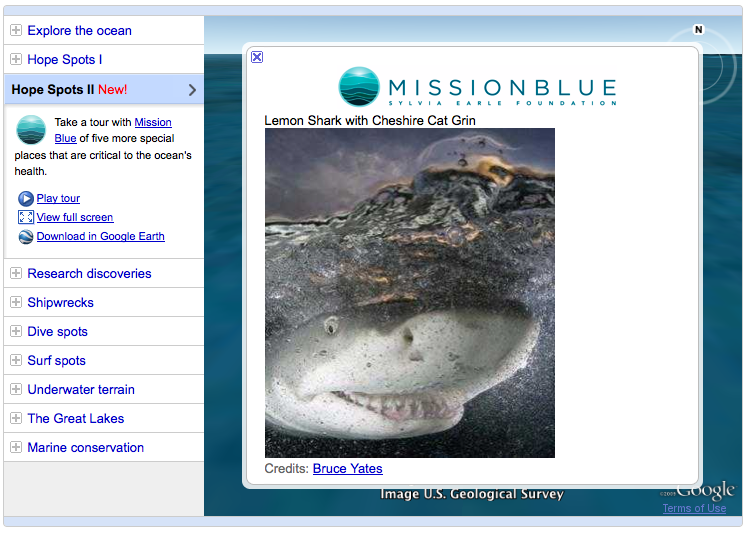 There are many ways to make the ocean a part of your Earth Day: take a virtual dive with Ocean in Google Earth, read more on Mission Blue's Act page, take a look at Disneynature’s new Oceans film, or visit the Save my Oceans action site. This photo was taken last week at the Navy Yard in Washington, DC with the Trieste in the background. Pictured from left are Dr. Don Walsh, who made the Trieste descent, Dr. Anatoly Sagalevitch, who made the first-ever descent to the bottom of the North Pole, and Dr. Sylvia Earle. Today marks the 40th anniversary of Earth Day, which provides us an occasion to highlight that part which covers 70% of the planet -- the Ocean. We’re releasing a second Hope Spots tour in the Ocean Showcase which features 5 more special places, compiled by the Mission Blue Foundation, which Dr. Sylvia Earle is targeting for protection as part of her 2009 TED wish.